2005 will be a special year at Sesame Place, the nation's only theme park based on the award winning television show Sesame Street, with a celebration to honor the innovative theme park's 25th birthday. The ultimate birthday party begins opening day, May 7, 2005, with the red carpet arrival of the Sesame Street characters and continues through the season culminating with a gala costume contest during The Count's Halloween Spooktacular, October 29, 2005. Guests are invited to celebrate the park's 25th birthday all season long at the place where Sesame Street comes to life through rides, water fun, entertainment and playtime with friends, including a new walkaround character – Baby Bear. Plus, guests will enjoy a 25th birthday-themed parade rolling down the neighborhood daily and a line-up of exciting special events including entertainment and special guest appearances during the 25th Birthday Celebration Series. Sesame Place, a licensee of the nonprofit educational organization Sesame Workshop and a division of Busch Entertainment Corporation, was developed to bring the Sesame Street television show and its values to life for children through play. What began as a 3-acre theme park 25 years ago has grown to 14 acres with more than three-dozen interactive activities, including water attractions, an action-packed roller coaster, choreographed live stage shows, and a musical parade. While the staff has grown from 119 in the first year to more than 1500 last year, the principles first established in 1980 are the same. A handful of employees have seen firsthand the change over 25 years from its original concept. Robert J. Caruso, executive vice president and general manager of Sesame Place, takes pride in the growth of the park. "It was important for us to understand the trends of the theme park industry and introduce innovative additions that reflected the Sesame Street brand. When Sesame Place first opened there were no water rides. Sesame Neighborhood, the replica of Sesame Street, was only a concept. Even the characters weren't here until three years later. 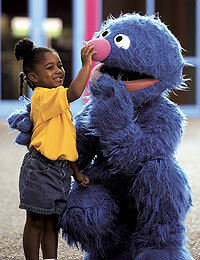 In fact, I remember Grover making a grand entrance by helicopter!" Plus, guests will enjoy a 25th birthday-themed parade rolling down the neighborhood daily and a line-up of exciting special events including entertainment and special guest appearances during the 25th Birthday Celebration Series. Over the years, water rides were added beginning with Slippery Slopes and other water chute adventures to Big Bird's Rambling River, a relaxing lazy river that opened in 1990. Sky Splash, the 3-story high interactive water slide with giant raft-like tubes accommodating up to six guests opened in 1995. Sesame Place added Sesame Neighborhood in 1988, the nation's only replica of Sesame Street, and "Vapor Trail," the child's introduction to the thrill of roller coasters in 1998. Big Bird's Balloon Race and Grover's World Twirl, two other popular rides were added in 2002. "Rock Around the Block", the choreographed musical parade starring all the Sesame Street characters with colorful floats is a top attraction at the park. And new live stage shows have been introduced repeatedly with another highlight being "Elmo's World Live" and 2004's "Big Bird's Beach Party." 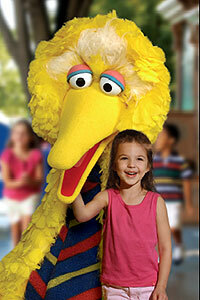 Sesame Place provides a place for celebration, fun and fun facts. Each year hundreds of children celebrate their birthday with parties at Sesame Place, and on July 20, 1994 one baby was even born in the park! Guests have enjoyed 3,500 performances of Elmo's World Live, 250,000 journeys on Vapor Trail and more than 500,000 blooming flowers throughout the park while consuming close to two million hot dogs. As for the number of hugs, high-fives and poses from Elmo, Big Bird and the other Sesame Street walkaround characters shared with guests over the years, it could be millions. Like the television show, parents bring their children to Sesame Place to tap into their child's sense of wonder and imagination. But children gain so much more when they visit Sesame Place. They are learning, growing and building a sense of self-confidence as they meet their television pals and discover fascinating challenges around the park. The unique opportunity for parents to interact, explore and play with their children in a Sesame Street-themed environment created especially for young children is the essence of Sesame Place. As children enter the front gates, they are bursting with excitement. Parents are experiencing the joy of providing happiness for their child. And for some, 25 years later, a second generation is visiting Sesame Place eager to share with their own children the thrills and nostalgia they experienced when they were young. As Sesame Place continues to build memories for future generations, it will continue to maintain the original concept to provide pure, wholesome, fun-filled, enriching and educational experiences for children and their families to share together. Sesame Place, an interactive play experience for families with children ages 2-13 and named one of the top four theme parks in the Northeast by Family Fun magazine, is a 14-acre theme park 30 minutes north of Philadelphia and 90 minutes south of Manhattan. Sesame Place offers over three dozen stimulating play activities featuring exhilarating water attractions such as Sky Splash, live stage shows, the "Rock Around the Block" musical parade, the thrilling Vapor Trail roller coaster and memorable Sesame Street character greetings throughout the day. Sesame Place is a licensee of Sesame Workshop and a division of Busch Entertainment Corporation, which operates Sea World, Busch Gardens and Discovery Cove. Sesame Place opens May 7, 2005. It is open Thursday through Sunday until May 26th when the park is open daily. After Labor Day, Sesame Place is open weekends only until October 29, 2005. Single Day General Admission is $39.95, children under 2 are free, and seniors (55+) are $36.95. There are varying selections of season passports including 25th Birthday Passport, Big Bird's Passport and Super Grover Passport with benefits throughout the season. To learn more about Passport benefits, Breakfast or Dinner with Big Bird & Friends, the line-up of special events and general park information, call 215-752-7070. Please note, prices listed above are before taxes. Sesame Place information is also available on the web at sesameplace.com.